We are always looking for opportunities to increase the diversity of our educational resources with new owls and other birds of prey. Increasing the variety of birds on show not only enriches the visitor experience, it also widens the bird knowledge of the falconers. All raptors play an essential role in the ecological system and by introducing visitors to as many species as possible the sanctuary hopes to highlight the conservation status of specific birds within the wider context of global protection issues. To this end, one or two new 'foreigners' arrive at the sanctuary every Spring from a variety of captive breeding programmes throughout the U.K. This year has seen the historic arrival of Rocky, a three week old Turkey Vulture Tura, a baby Siberian Eagle Owl and Taino, a four week old Ashy Faced Owl both bred locally. When these three youngsters arrived, they first took up residence in the falconers’ hut, in order to acclimatise them to living in close proximity to humans for the first few weeks of their lives. As they will be presented to the public in displays during their time with us, this experience is essential for the birds to “imprint" on the falconers, rather than on a parent bird as they would in the wild. In this process, the falconers become the focus of the birds’ attention and be recognised as their primary food source in order for them to become amenable to training when they are mature. Taino, the Ashy Faced Owl - who we introduced you to a few weeks ago - has now started his flight training in earnest, The first step encouraging a bird to fly to the glove is to fit it with soft leather anklets. Once the bird has become accustomed to these gentle accoutrements, leather jesses can be attached. Jesses are leather straps which allow the falconer to hold the bird on the fist and the means by which a creance, or long line can be attached to the bird in the early stages of its training. Now twelve weeks old, Taino is already flying confidently on the creance, allowing her the chance to familiarise herself with the environs of the flying ground - her future flight arena. She has also visited several schools in the local area and her endearing appearance and genial nature are quickly establishing her as a popular ambassador for the sanctuary. 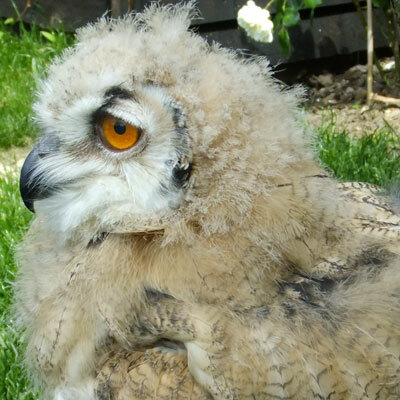 Tura, the Siberian Eagle Owl will soon commence a similar training programme, with trust and confidence being theessential elements for her rapid progression from a gangly, fluffy baby to an elegant, awe inspiring adult. Like Taino, Tura will take eventually part in the thrice daily flying demonstrations at the sanctuary, through which visitors can learn about the characteristics, habitat and current status of her species as well as experiencing the thrill of her flying at close quarters! As the baby of the trio, Rocky the Turkey Vulture can look forward to several weeks relaxing in the falconers hut before being called upon to do any work! At the moment this large white ball of fluff is only recognisable as one of his species, by his iconic bald head. By full maturity, his plumage will have turned brown and his head and feet a striking shade of red. Rocky the Turkey Vulture already displays the iconic vulture face - this will change colour as he matures. Unlike Black Vultures,Turkey Vultures almost never attack living prey in the wild: their chief form of sustenance is carrion and their amazing sense of smell, accommodated by their large nostrils, can pinpoint dead prey from half a mile away. Their reputation as scavengers is underscored by the way they feed: not being equipped with an efficient “tearing” beak, they will wait for Black Vultures to open a carcass and then move in to feed secondarily. 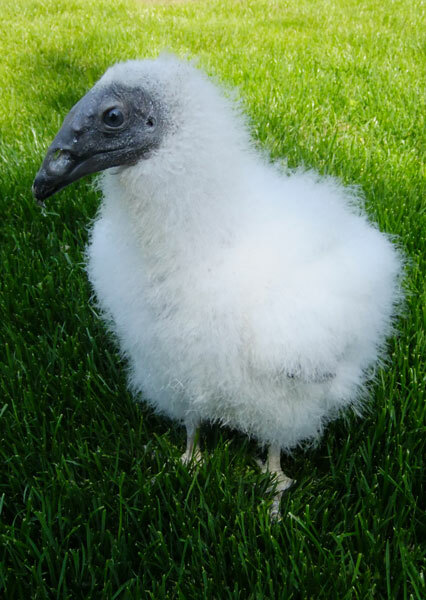 Turkey Vultures were threatened by the side effects of DDT in the past, but captive breeding programmes in their native North America have elevated them to their status as one of the most common large carnivorous birds in North America. 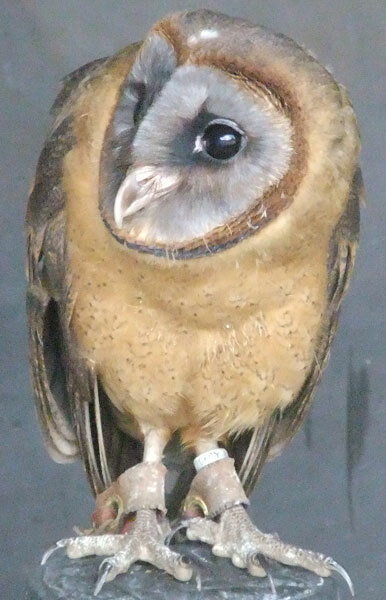 We hope that visitors to the Suffolk Owl Sanctuary will be inspired to increase their awareness of the current conservation issues facing all birds of prey through their close encounters with Tura, Rocky and Taino.